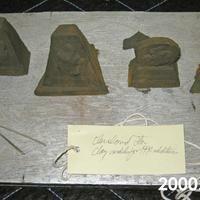 Four clay models for proposals for the Cleveland War Memorial expansion project. They are on a wood board. Each is a geometric shape and all four are different from one another.